UPDATE 1530 GMT: The US-led coalition carried out another 12 airstrikes on Saturday inside Syria. 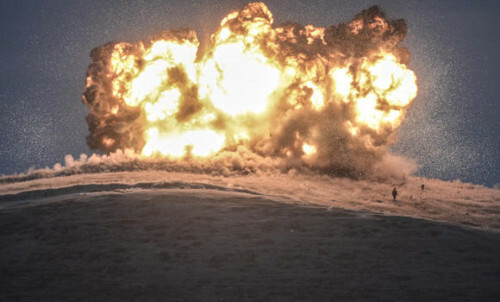 The Combined Joint Task Force said six strikes near the besieged Kurdish center of Kobane on the Turkish border destroyed Isis buildings, fighting positions, and vehicles. In Iraq, six strikes were carried out near Al Asad, Mosul, Falluja, Al Qaim, and Baiji. Targets included buildings, vehicles, and an Islamic State refinery. The US-led coalition stepped up airstrikes on the Islamic State inside Syria on Friday, with 19 attacks. There were also 20 strikes on IS positions in neighboring Iraq, the Combined Joint Task Force said. The Task Force said the Syrian attacks were concentrated in the north near the Kurdish center of Kobane, which has been besieged by the jihadists since September. The statement claimed that “two large Islamic State units and four tactical units” were hit and that buildings, a staging area, and several fighting positions were destroyed. The Assad regime’s warplanes have also been attacking the Islamic State this week, killing dozens of people and wounding many more in Raqqa, the largest city controlled by the jihadists. In Iraq, the US-led airstrikes were in areas from Tal Afar and Al Qaim near the Syrian border to Sinjar, where Kurdish forces have been trying to reclaim territory, to Mosul, Iraq’s second-largest city. The Local Coordination Committees record 55 people killed on Friday across Syria, with casualties especially heavy from regime bombing in the south. Of the 55 deaths, 21 were reported in Damascus and its suburbs and 14 in Daraa Province. The towns of Ibtaa and Dael in Daraa were among those hit by barrel bombs.